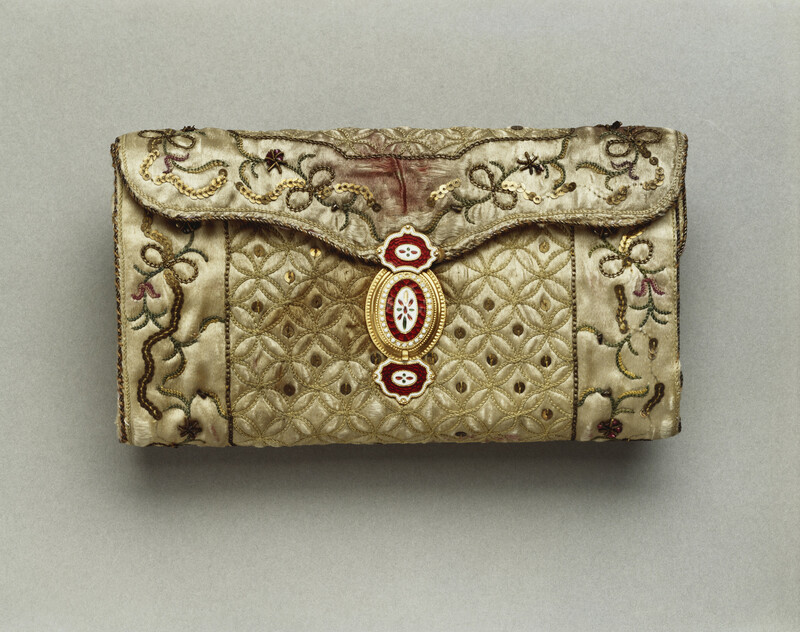 Cream-coloured silk pocket-book hold-all, embroidered with coloured silk and metal sequins, with enamelled clasp. Lined in pink silk and containing ten sewing tools. Reputedly made by Queen Charlotte. Queen Charlotte’s skill as a needlewoman is well attested. The encouragement she gave to this female accomplishment is underlined by her financial support of Mrs Pawsey’s school for ‘embroidering females’ and her patronage of the unusually gifted needlewoman Mary Knowles. This pocket-book, which was almost certainly worked by the Queen, was given to her friend Mrs Delany, who was also an accomplished artist and needlewoman, at Bulstrode, the home of the Queen’s and Mrs Delany’s close friend the Duchess of Portland. It came under cover of a letter, written at the Queen’s Lodge, Windsor, on 15 December 1781, in which the Queen asks Mrs Delany to wear ‘this little Pocket-Book in order to remember at times, when no dearer Person’s are present, a very sincere well wisher, Friend, and affectionate Queen, Charlotte.’ The ‘Pocket-Book’ was described by Mrs Delany’s waiting-woman in some detail: ‘Inside was a beautiful pocket case, the outside satin work’d with gold and ornaments with gold spangles, the inside lined with pink satin and contained a knife, sizsars, pencle, rule, compass, bodkin’. 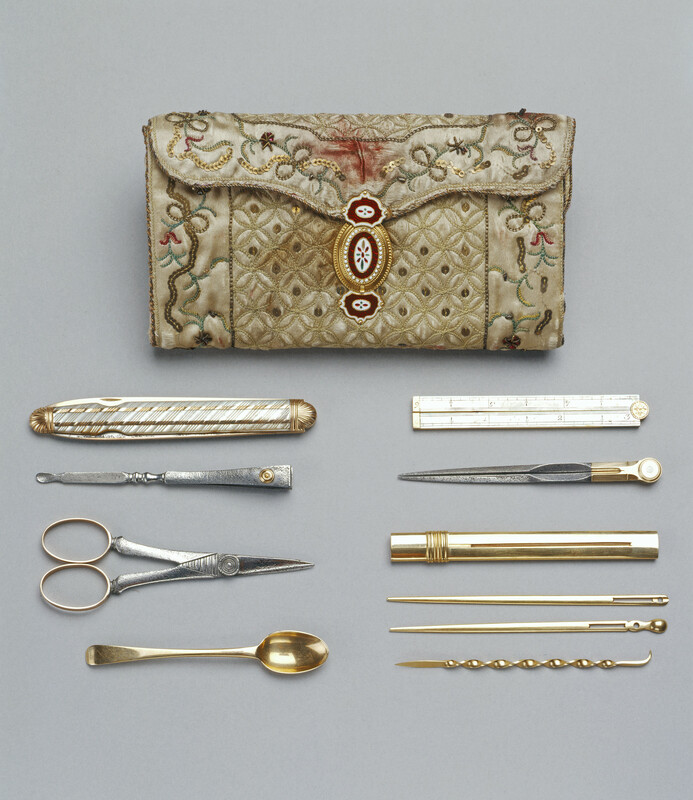 The contents of the pocket-book still include the implements described (a composite set of gold, mother-of-pearl and steel), of which the bodkin is marked with the unidentifiable maker’s initials GC. In the previous month, at Bulstrode on 13 November, Mrs Delany had given Queen Charlotte a small notebook containing fragments of silhouettes, of ornament and figures rather than flowers. In the following year, Opie’s portrait of Mrs Delany was painted for the King and Queen.